Off the southernmost tip of New Zealand lies a bushwalkers paradise. 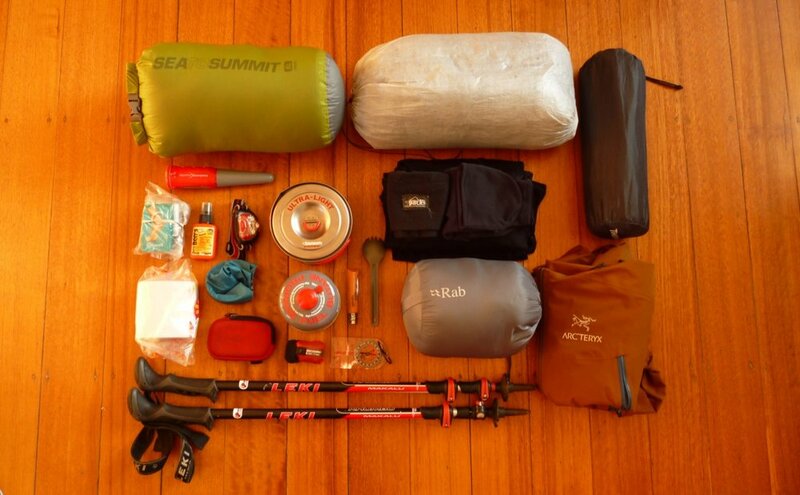 Make Stewart Island the destination for your next multi-day backpacking adventure. The two main islands of New Zealand are well known to tourism. But at the southernmost tip of the South Island lies a smaller island that is less well travelled. Stewart Island - also known by it's Māori name, Rakiura - is a one hour ferry, or 20 minute flight, from the New Zealand mainland. 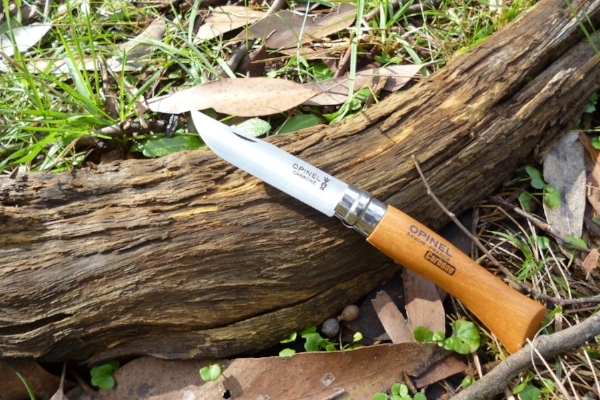 A trip to Steward Island is a trip to a bushlovers paradise. The island has only one town with a reported permanent population of only 381 inhabitants (at the last census). 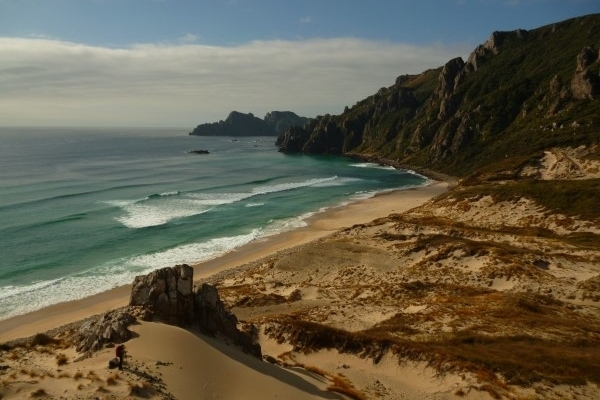 Over 80% of the island has been declared as a protected national park. And with less that 28 km of roads, and more than 280 km of hiking tracks, this island is built for hiking. Flying in can be an epic way to start your journey to Stewart Island, and given that the ferry is quite pricey anyway the flight can (almost) seem like good value. 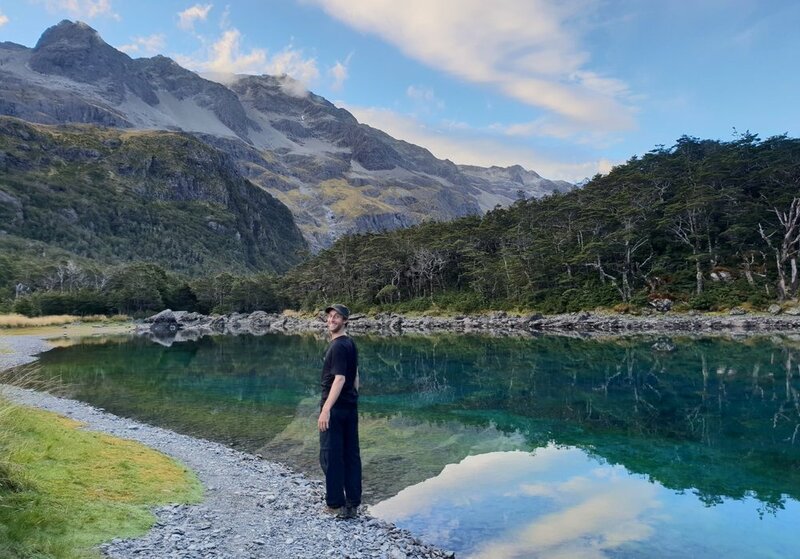 There are three main multi-day hiking trails on Stewart Island: Rakiura Track (3 days), North West Circuit (9-11 days), and Southern Circuit (6 days). Below, we describe the main features of each of these three trails. We also suggest a section of the North West Circuit that you might consider if you are short on time (instead of walking the Rakiura Track). Trail map showing stewart island's multi-day hikes: Rakiura Track (3 days), North West Circuit (9-11 days), Southern Circuit (6 days). Source: Department of Conservation. 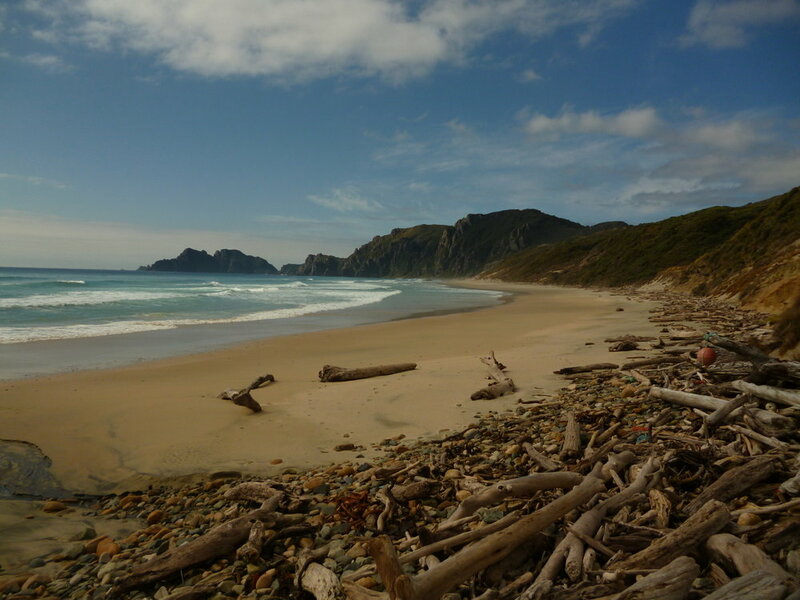 The shortest, and most popular, multi-day hike on Stewart Island is the Rakiura Track. This is one of the New Zealand Department of Convervation's flagship "Great Walks". This means that it is well formed, well maintained, and easy to navigate. Although the Rakiura Track can be tiring and strenuous for some, it will amount to an easy-to-moderate outing for most hikers. Much of the trail is a well maintained loose gravel footpath. As such, it is suitable for beginners or those with little hiking experience. But, for more experienced hikers, this trail can feel a little too well maintained and far from the true nature experience. The bulk of Stewart Island is covered in native bush accompanied by long stretches of untouched coastline. If you only have a few days, then the Rakiura Track can be a great experience and may be worth considering. It does travel through some sections of beautiful native bush, and many of the coastal views along the walk are stunning. However, if you are keen to get deeper into the Stewart Island bush, and are willing to encounter more strenuous terrain (e.g. mud and steep hills), then there are several other options that we believe are more rewarding. The North West Circuit will be the go-to multi-day hike for most visitors who want a true taste of Stewart Island. The full circuit is a significant undertaking for most, both in terms of time and endurance. Most hikers will take around 8-10 days to complete the circuit. The exact time will depend on your entry and exit points (more details below), as well as whether you plan to jump huts along the way. 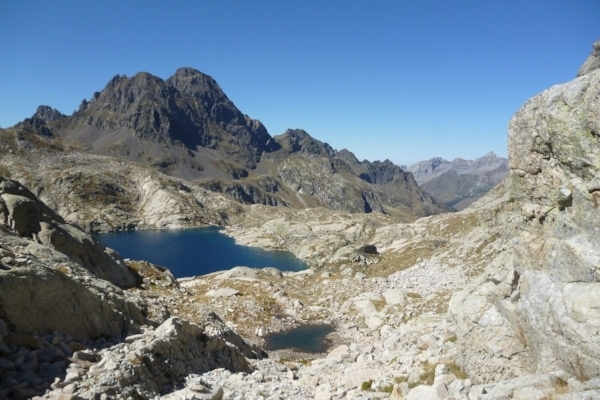 And although the geography here is relatively flat (the highest point on the hike is just 400 metres above sea level), the going can be tough. Knee-deep mud is not uncommon here. Most hikers do the full circuit in an anti-clockwise direction. One reason is that the toughest hill on this hike (in our opinion) is located between Freshwater Hut and North Arm Hut. By walking the circuit in an anti-clockwise direction, you will encounter this hill at the end of the walk when you have eaten all your supplies and your backpack is lightest. Not to mention that the Department of Conservation's brochure advertising the hike describes it in an anti-clockwise direction. But the North West Circuit can be walked in either direction. And in fact, our preference is for walking the circuit clockwise. 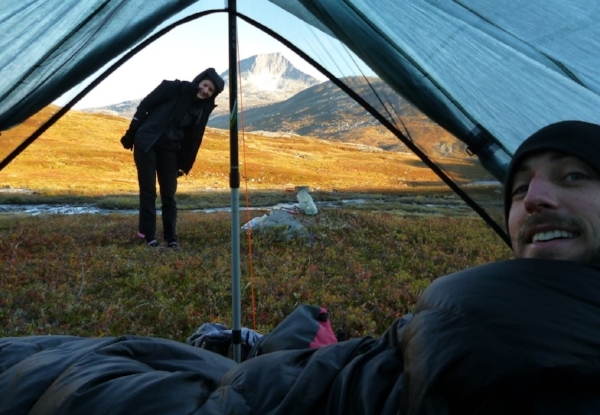 By doing this, you are walking in the opposite direction to most hikers, and therefore are likely to encounter a different group of hikers at each campsite or hut. If you are camping, then this isn't too important an issue. But if you are sleeping in the huts, you don't want to be stuck on the trail with a snoring sleeper for ten days. However, one potential downside of walking the circuit clockwise is that you encounter the hill over Thompson Ridge on your first day, when your backpack will be fully loaded with 10 days of food! This climb is only 300-400 metres elevation gain, but it is very tough going. Therefore, our suggestion is as follows: avoid Thompson Ridge altogether (unless you are keen for the challenge!). You can do this by arranging a water taxi in Oban that can take you to Freshwater Hut to start your hike. The water taxis travel up to Freshwater Hut most days (usually by arrangement), and are approximately NZ$60. The ride takes about 45 minutes in total, taking you across the beautiful Paterson Inlet (if you are lucky you might see bottle-nosed dolphins or other marine life) and then up the winding Freshwater River. Note that this trip can only be made at high-tide - when the entrance to the river is accessible - and so departure times vary daily. The water taxi ride up the freshwater river at high tide is made more impressive by the reeds, ferns, and other plants lining the riverbanks, especially as the river narrows in the upper reaches. From Freshwater Hut you can choose to either head straight on towards Mason Bay. The 15.5 km journey between Freshwater Hut and Mason Bay is relatively flat, and in dry weather is an easy 3-4 hour stroll. It is not uncommon to encounter kiwi birds along this part of track, even during the day. But, be wary that after heavy rain this track can become severely flooded (at the beginning of this section of trail you will notice depth markers - these will help guide you as to whether or not the water is high enough to make the trail unsafe to pass along). Or, if you aren't in a rush to set off from Freshwater Hut, then an alternative after exiting the water taxi is to climb Rocky Mountain (without your heavy backpack!). This "mountain" stands on the ridgeline above Freshwater Hut and, if the weather allows, provides panoramic views over Freshwater Flats and Paterson Inlet. You can leave your gear at Freshwater Hut, climb Rocky Mountain Track (5 km, 3 hours return), returning to Freshwater Hut for the night and heading onto Mason Bay the following morning. To find the Rocky Mountain Track trailhead you need to leave Freshwater Hut, heading a little way along the track toward North Arm Hut and you will see Rocky Mountain Track on your left. If you don't have a full ten days available, then not all is lost. Perhaps consider one of the variations of the Northern Circuit we describe below. that can be completed in 3-4 days. These might be suitable for those hikers who are keen to experience some of the less well manicured hiking on Stewart Island, but only have available limited time. Stewart Island's Southern Circuit is a serious tramping endeavour. Until now, we have avoided using the term "tramping" to avoid confusing our international readers. In New Zealand, "tramping" is generally thought to be synonymous with hiking. But, given that the word is peculiar to this small island nation, it embodies some of the characteristics that come with the territory. Think... bush, scrub, mud, tree roots, and water (and lots of water). The Southern Circuit covers iconic New Zealand backcountry terrain, and it can be tough going. If this is your first outing on Stewart Island, then perhaps look elsewhere. The North West Circuit is also a great challenge, and for most people will be more rewarding. Where the North West Circuit is predominantly along stunning coastline, the Southern Circuit will have you with your head down and trying to keep your footwear from getting sucked off in the bog. Several sections of this hike are prone to flooding, and so care needs to be taken after heavy rain. In fact, after heavy rain, many sections of the circuit will be impassable. The most natural entry and exit point for this hike is Freshwater Hut. A water taxi can be taken from Oban, across the Paterson Inlet, and up Freshwater River during high tides. See our description of the North West Circuit above for more details on this. Alternatively you can do the 1-2 day walk from Oban, over Thompson Ridge, to Freshwater Hut to start the Southern Circuit. The other possible entry or exit points are Fred Camp Hut or Rakeahua Hut. 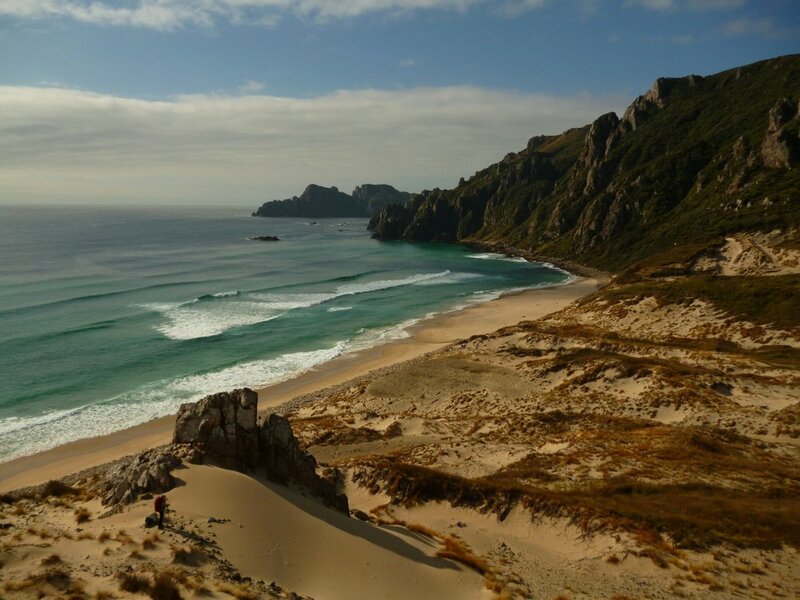 But note that these destinations are far less frequented than Freshwater Hut, so you must prearrange any transport if you plan to enter or exit at these locations (and the journey may be more expensive that landing at Freshwater Hut). For more info on this trail, see the Department of Conservation website. Or call the Rakiura National Park Visitor Centre direct on +64-3-219-0009 to discuss the current trail status. Stewart Island can be visited all year round, and it possible to do the aforementioned hikes at any time of the year. But, our recommendation is to visit sometime during the peak summer months, when the weather is warmer, sunny days are (slightly) more likely, and the daylight hours are longer. We suggest visiting December through March. During this time average daytime temperatures are in the range of 15 to 18 degrees Celsius (59 to 64 Fahrenheit). Compare that with the winter months when average daytime temperatures are in the range of 7 to 11 degrees Celsius (44 to 51 degrees Fahrenheit) and it becomes noticeable that the extra few degrees could make a difference to your comfort levels. The other thing to recognise is that summer does not guarantee clear skies. Not here and not anywhere in New Zealand. Stewart Island is beautifully green, but the main ingredient for the lush vegetation here is rainfall. And it falls all year round. Annual rainfall on the island can be upwards of 1.5 metres. So always be prepared for rain and - if hiking - mud. 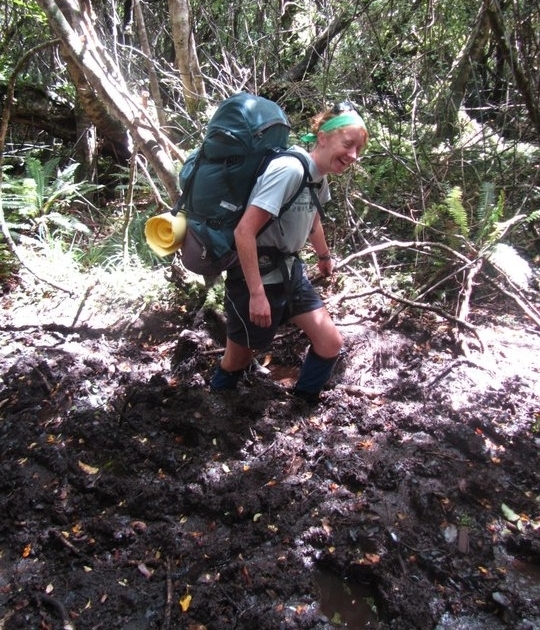 Stewart Island is notorious for it's mud, which can make the going much tougher. Ferry is the most common and cheapest way to get to Stewart Island. There is currently only one ferry operator, Stewart Island Experience, charging NZ$139 return or $79 one way for an adult (prices correct as at June 2018). The journey is approximately one hour, departing Bluff at least two times a day (more in the peak seasons). The departure port at Bluff is about 30 minutes drive south of Invercargill, which is the last major town. If you do not have a vehicle, then for an additional cost you can combine your ferry ticket with a coach from Invercargill ($25 one way), Queenstown ($75 one way), or Te Anau ($75 one way) - see here for details. Since the ferry ticket is already relatively expensive for such a short journey, then an alternative to consider is flying into Stewart Island. Flights are operated by Stewart Island Flights. The flight will set you back about NZ$215 return or $125 one way, so the cost differential between flying and the ferry is not particularly large. In addition, the flights depart Invercargill Airport thereby saving you the 30 minute drive to the ferry port at Bluff. This may not seem important, but if you don't have your own transport and were planning to pay for the coach between Invercargill and Bluff ($25 one way) then the cost differential between air and sea becomes even less! The journey by plane is only 15-20 minutes, but if you pick a day with clear skies, then the views can be stunning. The airport at Steward Island is no more than a concrete strip and a padlocked gate. So on arrival you will be met by a courtesy van that will drive you down to Oban township. Two things to note are that if you are booking last minute it is worth enquiring about hot seat specials (i.e. filling the last seats of a plane). In addition they offer several specials for students, over 60's, YHA members and more. Lastly, if you are flying, beware that you won't be able to take cooking gas canisters in the air due to the flight regulations! So don't purchase them ahead of time. Instead, grab them on your arrival at Steward Island. The general store sells them, as do a number of the tour operators, for example Ruggedy Range. You won't find a check in desk or baggage carousel at this island airport. Stewart Island's main and only village, Oban, has a small general store with limited supplies. In addition, one of the main tourism operators on the island, Ruggedy Range, operate a small store in Oban - see here for their website. However, for the most part, the options for purchasing food and/or equipment on the island are very limited. So if you need supplies, we suggest you purchase them before departing the mainland. The ferry port town of Bluff has a small supermarket. However, if you need major supplies then we suggest purchasing them in Invercargill before heading to Bluff. In Oban you can find a number of accommodation options ranging from private house rentals or fancy bed and breakfasts through to basic hostel dorms and camping. Nonetheless it is always wise to consider booking (or at least enquiring) ahead of time, particularly in the summer season. There are also a couple of cafes (with variable opening hours), restaurants, a pub, as well as a trailer on Ayr St (just back from the marina) serving classic kiwi-style fish and chips. There is also a National Park Visitor Centre where you can get up to date info about trail status, see here for their opening hours.